Today is paperback book day – which is a perfect day for me to suggest you go visit the website of Leah Ferguson, one of my two awesome my sisters-in-law. 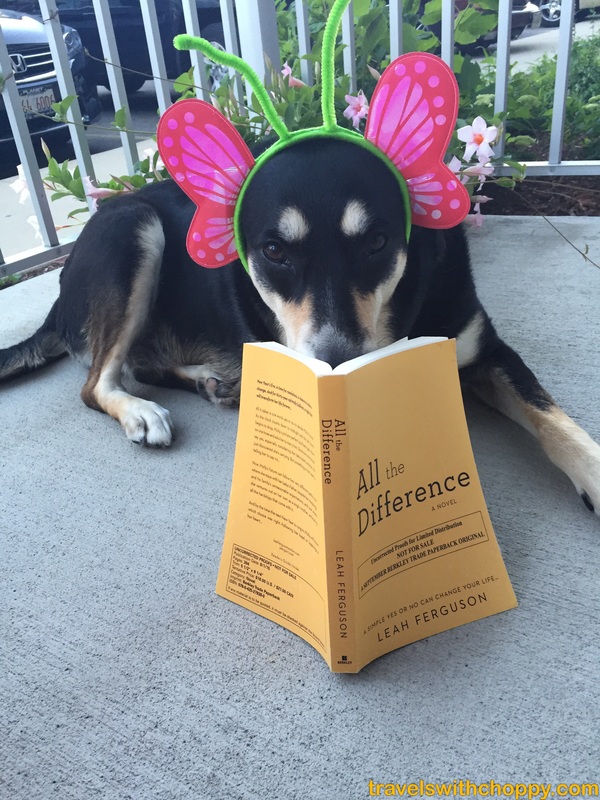 Her first novel, All the Difference, comes out in almost exactly a month. I read an advance copy of the book, and I loved it (as in, read the whole thing in one sitting sort of love, then forgot to tell her this little detail when I texted her about it several days later – but I guess she knows now! Yay Internet!). It’s exactly the sort of book I have to limit myself to reading – fast-paced and funny, it’s like reading about the adventures of a friend (or someone I would like to be friends with). Anyway, the point of this is, go to her website and pre-order a copy! (P.S. – It’s not just me who likes it. Here’s some other people who do, too, and I am pretty sure Leah isn’t related to any of them). Choppy gives this book four paws up. Choppy would be happy to give it to you so she isn’t stuck with it! This is awesome that your SIL is being published. Congrats to her. It’s so exciting! We are going to her book release party in September – it seems so close after a long time waiting for it! She does – anything that means she has to take a picture that only requires a small amount of dressing up! I hope so – it’s so exciting to watch her go through this! I had no idea that Choppy could read too! She’s a talented dog (or pretends to be!). No wonder you, and Choppy and I get along so well. I happen to be a talented writer who pretends to be a talented writer! Love that photo. I might have to print it off and keep it in my classroom for the students to see.